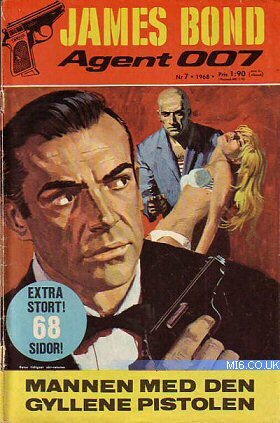 Whilst the James Bond comic strip series was first published in UK newspaper The Daily Express from 7th July 1958, fans in Sweden had to wait seven years until the first translated versions of the strips landed on their shores. 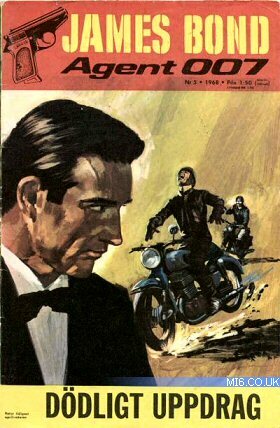 Rather than finding a national newspaper to run the daily strips, Swedish publisher Semic collated the stories in to a comic book titled "James Bond, Agent 007", releasing issues periodically through the years. 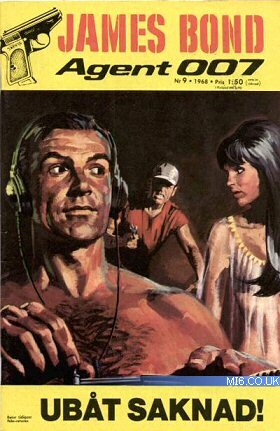 Due to the switch from long narrow strips of 3 or 4 cells to a portrait comic book, Semic reformatted the original artwork by John McLusky and Yaroslav Horak - sometimes crudely adding artwork where needed, and sometimes removing redundant cells due to the shift away from the daily serialization. Semic continued to use the original strip material up until 1981, when it started to introduce original adventures for the Swedish readership. As the newspaper strip came to an end in 1985, Semic increasingly relied on their new stories, and this spelled the beginning of the end due to their varying quality. 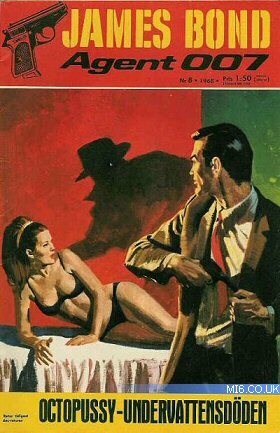 After merging with fellow ailing comic "The Saint", the comic book ceased publication in Sweden in 1996. One page 'pinup' photo of Sean Connery as James Bond, one page photo special on Honor Blackman, Daniela Bianchi and Claudine Auger, one page photo of Bond and Kissy from the film "You Only Live Twice. One page 'pinup' photo of Dr No, Emilio Largo and Oddjob from the film series, one page photo of Sean Connery in Japan filming "You Only Live Twice", one page photo of Sean Connery as 007. 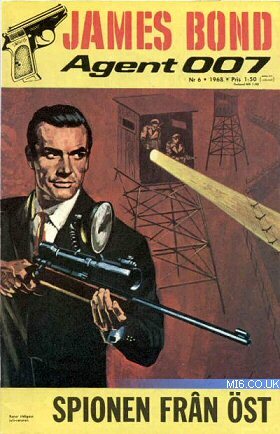 One page special in Milton Crest as depicted in the comic strip, one page 'pinup' photo of Sean Connery as 007.